Showing results for tags 'handmade'. And again: a set of very debonair and mysterious dames representing various cities. See how good they look on the sofa. Download the designs here: French coquette 2 machine embroidery design, English coquette machine embroidery design, Spanish coquette machine embroidery design, French coquette machine embroidery design. This is piece of cotton fabric decorated with Gnome in red phrygian cap and boots embroidery design. Due to this funny picture it can be used for creating pretty handmade gift for Christmas or New Year. This sample is able to make merry festival mood for anyone who looks at it. It’s time to think about gifts for your friends and relatives! 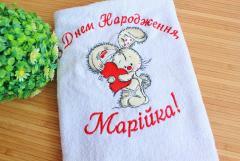 This is pretty terry towel prepared as useful and pleasant gift for Valentine’s day. It is decorated with memorable inscription: it is wish to keep love for many years. 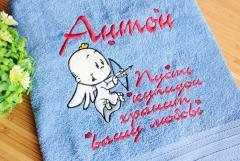 These warm words are added by Baby cupid embroidery design. It is funny picture reminding illustration from children’s book. It will definitely raise your mood when you look at it waiting for holiday. 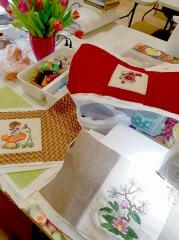 This photo shows creative process in sewing studio. On table you see some pieces of fabric. Each of them is decorated with different embroidery sample. They are Red and purple swirl flowers embroidery design, Friendship with frog embroidery design and others. Author used small patch as background to chosen sample because it has identical color scheme with main fabric. Due to this technique work piece look very harmonious. 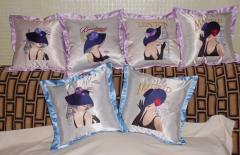 This is decorative pillow with embroidery-congratulation. It is a great way to show your love to members of your family. This gift is prepared for nephew by his loving aunt. It is decorated with thematic inscription and Teddy Bear with lily embroidery design. It is very interesting to see similarity of two fluffy bears on this photo: one is real toy and one is embroidery sample. 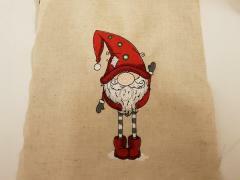 This is pretty Christmas embroidery which consists of two sample of same style. They are Stylish snowman embroidery design and Fancy snowman embroidery design. Author perfectly combined these original and nice pictures in all details. They have suitable size, color scheme and even turn of their heads. Due to this accuracy they looks like looking to each other with smile and friendship. This is little pretty cushion which is prepared for young parents because of birth of their little daughter. This thing is best memorable souvenir for this event. It is decorated by Baby panda embroidery design and consists all important information about little girl including her name, date and time of birth, her weight and height. So her parents will remember about this happy day every time when they see this nice handmade accessory. 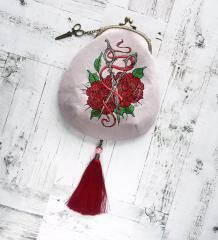 This is wonderful little handbag with very well elaborated design made by Olga Varbitskaya. It includes many little details which perfectly combine with each other. Certainly center of entire composition is Vintage scissors and ribbon embroidery design. But it looks much more impressive due to soft tassel of same color and little iron scissors which are used as keychain on top part of this bag. This is beautiful composition on winter theme which is beautiful enough to be postcard. It is made from two textile figures made with embroidery standing on mat with thematic picture. You also can create such souvenir using Santa Claus cross stitch free embroidery design and Snow Maiden cross stitch free embroidery design. This sample has to be applied on cone from dense fabric. You may use it yourself or give to your friend as Christmas gift. This is comfort and soft terry towel which is necessary bath accessory for everybody. But it is not just useful thing: due to Bunny hugs your heart embroidery design it becomes original and unique thing which will definitely please its addressee. Pretty portrait of fluffy rabbit made by Kreativnaya Shtuchka is added by thematic inscription. It contains warm greetings for birthday girl with beautiful name. This is funny embroidery sample executed by Monica Sandström. Meeting on lantern embroidery design is good for decoration of clothing or accessory fir person with good sense of humor. There are two fluffy birds sitting on pillar of street lamp. They look a bit surprised by seeing each other. It seems each of them didn’t expect to meet anyone at this late our on its favorite place. This is pretty soft prepared as handmade gift for little addressee with great love. Dress of this big funny bunny is decorated with Bunny hugs your heart 4 embroidery design. This picture is chosen especially. Firstly is has suitable color scheme which looks very bright on main background. Secondly it shows all warm feelings to little baby who will get this gift. 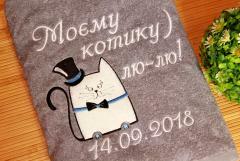 This is embroidered terry towel prepared as original and unique gift for nice man’s birthday. It is added by funny inscription full of love and date of this memorable date. 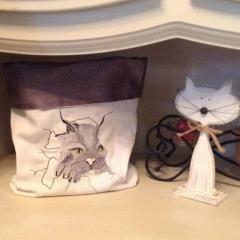 Center of composition is Gallant cat embroidery design. It is unusual portrait of square cat in cylinder on its head. It is easy but interesting sample which is suitable for man who loves good jokes. 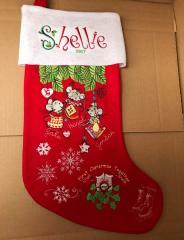 This is complex and interesting traditional Christmas sock which is decorated with many original embroidery samples and name of its owner. 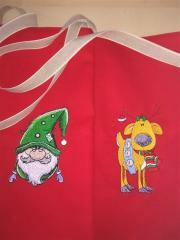 Main of these pictures is Christmas mice embroidery design. This funny image is able to make anyone smiling. There are three mice sitting in mittens and on toy on fir tree’s branches. This is really best kind of pack for holiday gift! This is pretty sock prepared to be filled by gifts for Christmas. It is decorated with its owner’s name, Cute Snowbound balloon embroidery design and some other embroidery samples including snowflakes. Just look at this funny picture! Cap of gnome looks exactly like tasty sweetie which he try to hide behind his back and snow on balloon reminds about coming Christmas. This pleasant soft toy is gift for little girl prepared for Christmas and New Year holidays. It is not mass market product but unique work piece full of love and warm feelings. Just look: dress of this funny pig is decorated by New Year tree 4 embroidery design and thematic inscription. Certainly addressee of this gift will be very happy with it. This is two bright textile bags which are prepared as packs for Christmas gifts. They have same design except of embroidery samples used for its decoration. 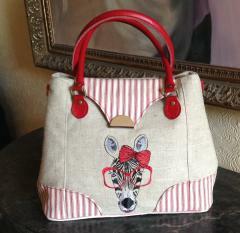 They are Amiable gnome embroidery design and Santa's deer embroidery design. Certainly addressee of these gifts will be happy to get them. Pay your attention how author changed original color of dwarf’s costume to make it different from background. This is traditional Christmas sock which is ready to be filled by holiday gifts. It is executed on bright color scheme identical to Santa Claus’ costume. 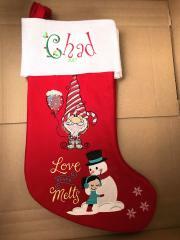 Its front side is decorated with Christmas angel 3 embroidery design and some more embroidery samples. You may note that this work piece was made for 2017 New Year but you may use it for all further festivals. 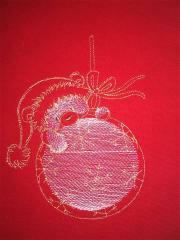 This is pretty embroidery sample full of Christmas mood. At same time Xmas fun embroidery design is made with just one color of thread so it is easy enough to be made even by beginner. You need only some time and patience to create this cute muzzle of Teddy bear in funny Santa’s cap with toy for Christmas tree. Lia Van de Water, author of this work piece, used original color solution for this embroidery. This is beautiful and useful gift which is also full of deep life sense. Just look at Family is the Key to happiness embroidery design used for its decoration. It is added with warm wishes intended to father who is addressee of this pretty handmade work piece. All these elements are executed with only two colors of thread which make impressive contrast with background fabric. This is very cute handmade gift prepared by Kreativnaya shtuсhka for nice man’s birthday. Warm feelings of author are shown by expressive inscription and Bunny hugs your heart 4 embroidery design. This pretty portrait of fluffy bunny is best way to demonstrate your love to somebody. Addressee of such gift will always remember you looking at this nice work piece.